It's never too early to begin teaching kids about money. The money lessons they absorb as children can influence the financial decisions they make as adults. There are many different tools you can use to help teach kids about money but a savings account may be the most useful. 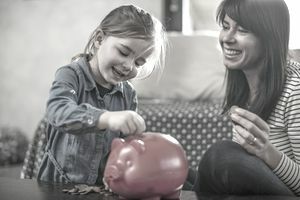 Helping your child to set up their first savings account, or talking to them about how you use savings accounts to pursue your financial goals, can ingrain the savings habit. As you work on teaching kids about money, here are the most important things to cover with savings accounts. Teaching kids about setting financial goals matters for two reasons. First, it can help them understand the value of giving the money they're saving a purpose. Saving money just to save can lose some of its luster when you don't have a plan for using that money eventually. And, it can be tempting to dip into savings when those dollars and cents aren't earmarked for any specific reason. Setting goals is also a motivator to continue the savings habit. It can help kids understand concepts like delayed gratification and the difference between wants and needs, both over the short- and long-term. Talk to your children about saving in the context of using the money to pay for smaller things, like a toy from the dollar store, and bigger wants, such as a new video game console. If they have more than one thing they want to save for, help them set up savings subaccounts if that's something your bank allows. This way, they can have different "pots" to allocate savings as they work towards their goals. Teaching kids about money goals first can set the stage for the next savings lesson: deciding how much to add to savings. There are two different topics to cover here. The first is deciding how much to save for their individual goals, based on how long they have to reach their goal and how much they can save weekly or monthly. Say your son wants to save $300 to buy a new tablet. He receives a $40 monthly allowance and usually gets $50 in birthday money each year. He wants to buy the tablet in six months, just in time for his birthday and he already has $10 to start his savings cushion. Together, you work out that if he saves the $50 in birthday money and all of his allowance, he'd have enough to cover the purchase. But, he's not so keen on saving all of his allowances, so he decides to adjust his goal to buy a tablet in nine months as opposed to six. Now, he needs to save $28 a month from his allowance, plus his birthday money, leaving him with $12 a month to spend. Helping your kids work about different savings scenarios can help them understand the effort that's required on their part so they can decide what they're comfortable with. The second part of the discussion involves saving money for emergencies. Twenty-three percent of Americans have no emergency savings, and while your kids might not have to worry about unexpected expenses now, that could change as they get older. When their car breaks down or their cat gets sick and they have to rush it to the vet, you want them to have the cash to draw on so they don't have to turn to credit cards or ask you for a loan. Talk with your kids about why having an emergency fund matters and if you're comfortable, share some of the details of how you went about building your own emergency cushion. For example, if you have three, six or nine months' worth of expenses in emergency savings, talk to them about why you chose that number. Then, break down the mechanics of what you saved weekly or monthly to get to that amount. While you're teaching kids about money using a savings account, don't forget to mention how interest can help them grow their money faster. Explain how compounding interest works, what an annual percentage yield for savings is and how to compare APYs for different savings accounts. Point out that high yield savings accounts typically offer higher rates from regular savings accounts. It might be helpful to run some examples of how much interest they could earn over the course of a year with a regular savings account versus a high yield one. For instance, a $1,000 deposited into high-yield savings account with an APY of 2.05 percent would earn $20.69 in interest over the course of a year. That same amount deposited in a regular savings account with an APY of 0.01 percent would just a dime in interest over a year. You can extend the examples out to show how powerful compounding interest can be over time. For example, after 10 years, the $1,000 deposited in the high yield savings account would grow to $1,227.31, even if they never add another penny to their savings. Teaching kids about money isn't something you do once. It's an ongoing discussion that should evolve and continue as they get older. Including savings in those conversations, even when kids are very young, gets them used to the concept and giving them their own savings account affords them an opportunity to put the ideas you're talking about into action. Are Rewards Savings Accounts a Good Deal? Are Savings Accounts Really Free or Should You Look for Hidden Costs?